ECU chip replacement on Porsche 968. In the left hand side foot well on a RHD car you will need to pull the floor carpet back towards the seat. Locate the top of the carpet under the dashboard and this is normally only stuck down with Velcro. To hold the carpet back simply place something heavy on it. Under the carpet you will see a plywood board with 4 screws, undo the screws and remove the board. Once you have removed the board locate a black plate which has the ECU box attached to the back of it. Undo the securing screws. Lift the clamp from the ECU cable and unlock and lift away the cable. Take the ECU box to a place where it is clean and dry and you can work quietly. It would be best to Earth yourself in some way possibly by touching the back of a PC or better still invest in an earthing strap. Static electricity is your worst enemy at this point. The ECU box is made of aluminium and is held together with folding tabs, locate the tabs and gently pry them away enough so that the 2 halves of the box are able to come apart. 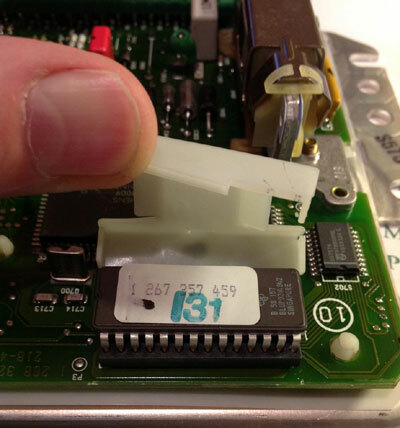 Once apart you will need to identify the chip that needs replacing, all other chips will normally be soldered into place but the one you are looking for is just pushed into a chip socket, possibly with a white plastic cover on it. DO NOT attempt to pry the chip out from one end only, alternate between ends prying a little at a time until both ends are coming away from the socket evenly. To install the new chip locate an indent which will line up with a similar one at one end of the socket. Place the chip over the socket ensuring that the pins line up with the holes and gently push the chip into place as evenly as possible. Now just complete the installation by reversing the above instructions. Replace the plastic cover if it had one onto the chip. Reassemble the box and fold over the tabs. Reattach the cable and cable clamp. Secure the box to the black plate and secure that into the car.